Visiting The Wave, a sandstone formation near the Utah-Arizona border. This is the second essay in a two-part series about my road trip to visit The Wave near the Utah-Arizona border. Read the first essay about my painful stop at the fakest place on Earth for the whole story. ARIA CANYON-VERMILLION CLIFFS WILDERNESS, Arizona — While sitting in my office at work surfing the Internet, the travel gods looked upon me fondly when they presented me with a Los Angeles Times article about the The Wave — a sandstorm formation near the Utah-Arizona border — that prompted me and my friend to embark on a last-minute road trip. But the travel gods don’t always treat me well. Even ignoring the pain Las Vegas brought me earlier during this very road trip, I have not easily forgotten my fall into an ice-cold Alaskan river, my cramped ride in a dangerous speed boat in Laos, or my disastrous attempt to visit Mount St. Helens. Nevertheless, my friend and I sped through the dark flatness of the Nevada desert toward The Wave with our trust in the travel gods as our only plan. Our trip required a lot of faith, because seeing The Wave on a whim is not easy. To maintain the pristine sandstorm formation and prevent overcrowding, The Arizona Bureau of Land Management allows only twenty people access to The Wave per day. The Bureau allows reservations for ten of the slots four months in advance through its website, but the other ten are given out by lottery at 9:00 AM Mountain Time on the morning before the day of the hike. Since we had decided at the last minute to visit The Wave, we had no choice but to try our luck at the lottery, but we knew our long drive would not be able to get us to the Paria Ranger Station in Utah in time. To deal with this problem, we posted an ad on Craigslist before we left and hired a St. George college student to attend the lottery and obtain our permits for us. As we drove, my friend used her iPhone to search the Roadside America website for on-the-fly, visit-worthy roadside highlights, but the Grafton ghost town in Rockville, Utah, the landlocked lighthouse in Cedar City, Utah, and the World’s Largest Thermometer in eastern California all seemed too far from our current trajectory to warrant a visit. We didn’t mind; our devotion to the travel gods gave us hope we would reach our most important destination: The Wave. About an hour east of Las Vegas, we stopped for gas in a tiny town named Glendale, and as we pulled into the station, we noticed a group of teenagers excitedly milling around a fence. Curious, we walked toward the group and discovered the entrance to the Glendale Haunted Corn Maze. For the unacquainted, a haunted corn maze is a network of passages cut into a large corn field, filled with people in scary masks and face paint trying to startle and chase after fright seekers attempting to navigate the maze. We didn’t know quite what to expect, but this lucky stop, awarded to us by the travel gods, seemed to fit perfectly into our trip philosophy. We paid our admission, and soon we were running from a man with a chainsaw in a cornfield under the desert sky. The smell of agriculture and the sound of laughing teenagers filled our heads, and at once, my Midwestern soul felt a strong nostalgia for the simplicity of small-town American childhood. After we escaped the disappointingly simple maze, we spent the night at the Bob-Bon Inn in Kanab, Utah, a motel with a mysterious tagline: “Utah’s Little Hollywood.” We never understood it. The next morning, we awoke very early, and in the darkness before sunrise, we drove 45 miles to an eight-mile dirt road leading to the trailhead. As dawn broke, we began the trail-less backcountry hike with a detailed map, compass, and an iPhone running GPS Kit to guide us. We savored the sunrise as we leisurely hiked across the long-shadowed red Utah and Arizona desert, stopping frequently to take photographs, scrutinize lizards, and marvel at the area’s unique sandstone formations. Near a particularly striking rock arrangement, we lay down in the cool, rust-colored sand, enjoying the otherworldly wilderness. Soothed by the feeling of the fine sand on our faces and impressed by the desert geography, I wondered aloud whether we needed to bother finding The Wave; the rest of the desert seemed therapeutic enough. But we soon found ourselves sitting on the edge of The Wave, eating lunch while watching a European family and a gaggle of professional photographers all in awe that a place so improbable could exist on Earth. As we became hypnotized by the red-orange bands of the entrancing sandstone, I imagined sitting in a tasty vat of an alien confection, covered in coral candy goodness. We hiked over bizarre fields of brains and up steep walls of stretched taffy, all the while taking hundreds of photographs. Adequately capturing the carrot-colored universe with my camera seemed impossible. Unfortunately, we couldn’t stay forever, and we reluctantly began our hike away from the shadows of the sanguine desert buttes and back to the car. For the first time in sunlight, we drove back through the Utah desert, and as we passed expanses of cacti and imposing mountains, my friend looked at the remarkable maroon hues of the desert crags and quietly said, “Purple mountain majesties,” as if suddenly understanding for the first time. This day, the travel gods were exercising their generosity. A child crawls on the red-orange sandstone at The Wave. A lizard rests on a rock in the Utah desert. A feather lies in the cool, red sand of the Utah desert. A hiker walks in the distance beyond desert cacti. Visit the Arizona Bureau of Land Management permit information page to learn how their permit system works. If you have the time, apply for your hiking date four months in advance on the Coyote Buttes Permits page. If you want to try your luck at the walk-in permit lottery, visit the Paria Ranger Station (62 miles east of Kanab, Utah) March 15 to November 15, seven days a week, by 9:00 AM Mountain Time the day before you plan on hiking. The closest major airports are Las Vegas and Salt Lake City; the closest regional airports are St. George, Cedar City, and Flagstaff. Be sure to bring $7 in cash per person in your group. If you obtain permits, drive to the Wire Pass Trailhead on the scheduled morning of your hike (shown on the BLM’s map) by driving 68 miles east of Kanab, Utah and driving the 8.3 miles down the dirt road to the trailhead. 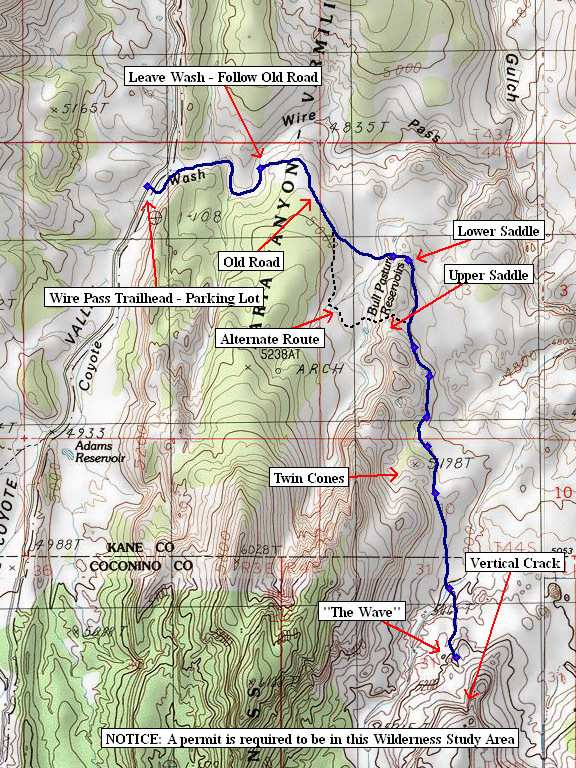 Using the detailed guide and map provided by the BLM, use a compass or GPS device to hike to The Wave. A GPS device can be extremely helpful; hikers often get lost looking for The Wave. You can also use this helpful map and this online guide, which includes GPS coordinates. View my route and download the Without Baggage Wave GPS track in GPX format. I have wanted to see this for a while. Didn't realize you needed a permit! Many western movies were filmed around Kanab UT. Many of the stars stayed in Kanab. That's why its associated with Hollywood. So, you won the lottery? Hi, can you please advise in which section to post the ad? How much did you offer to pay for the student to go and obtain the permit? Thanks! The TSA’s wacky security precautions have become even wackier. I’m a filmmaker, writer, and travel addict. I’ve traveled to over 50 countries while writing this travelogue. Tour guides annoy me. I believe traveling slowly across landscapes is important. I think travel can change people, if it's the right kind of travel.